Italian food is well known for using fresh ingredients packed with nutritional value. Italy is the optimal environment for healthy produce to grow naturally, and traditional Italian food has evolved using the ingredients provided by the land. Most people are aware of the obvious nutritional value in fresh VEGETABLES, but some commonly used ingredients are often overlooked – spices. Spices are the finishing touch to a dish, and add the extra flavor that helps bring unity to the ingredients. The powerful flavors provided by spices are an obvious benefit, but did you know they are packed with nutritional power? Stay tuned, because we are going to examine the factors that make spices the humble blessings of food, and how they add to a dish in both taste and nourishment. To do this, we need to break down Italian Seasoning’s ingredients one at a time. Basil is considered one of nature’s healthiest herbs. 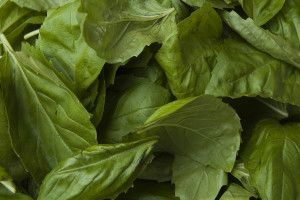 Packed with vitamin K, vitamin A, manganese and copper, it is safe to say that basil is a “superfood.” When you examine this herb for its vast health properties, the desirable taste it provides is almost a side note. Vitamin K is essential for cardiovascular health, and plays a key role in regulating blood clotting. The Vitamin A prevents the oxidization of cholesterol in blood, which helps prevent atherosclerosis, heart attack and stroke. Basil also contains magnesium, which helps blood flow by prompting muscles and blood vessels to relax. This decreases the risk for irregular hearth rhythm or heart / muscle spasms. Basil’s volatile oils have an anti-inflammatory effect, which can alleviate joint pain and reduce swelling. The beta carotene in Basil helps defend from free radical damage, which contributes to various health conditions including asthma and arthritis. The anti-inflammatory properties of basil makes it an ideal herb for combating joint pain and swelling. It is eugenol, one of the volatile oils, that is credited for blocking an enzyme known as cyclooxygenase (COX), which is the same enzyme that is targeted in pharmaceutical anti-inflammatory medication. Basil also has antibacterial properties and flavonoids that are DNA protecting. The flavonoids and oils in basil can be attributed to many of it’s health properties, which restrict the growth of harmful bacteria. 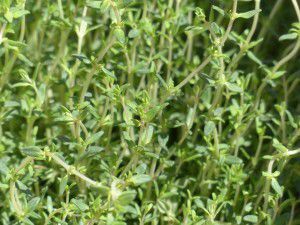 Thyme is a powerful herb with a history as a natural medicine. 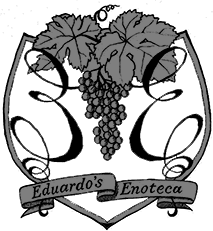 It is known for its healing effects propagated by it’s volatile oils. It’s fragrance adds a satisfying aroma to any dish, and it’s an indispensable member to Italian seasoning. As a nice bonus, it is packed with Vitamin C, iron, manganese, copper and fiber. The antioxidant properties can be credited to Thymol, which can also be attributed to the herb’s name. Thymol is a volatile oil which protects and increases the amount of healthy fat found in cell structures. Studies show the amount of DHA in the brain, heart and kidney cell membranes increased after thyme supplementation. It also contains various flavonoids helping increase the herb’s antioxidant capacity. The volatile oils in thyme are effective in protecting against various bacteria and fungi due to their antibacterial properties. For this reason, thyme played an important role as a food preservative for thousands of years by protecting microbial contamination. It has this in common with basil, and both serve as preservatives for food helping fight harmful bacterial cultures and strains. 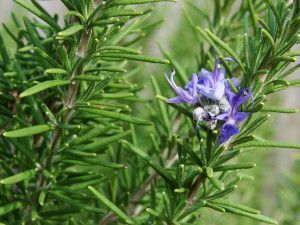 Rosemary, like other herbs, has been used as a natural medicine throughout history. It has many uses, and is loaded with vitamins, minerals and nutrients. Most people love rosemary for its pleasant aroma and taste, but some of its health benefits might surprise you. Because rosemary is a natural stimulant, it helps the body produce red blood cells. The stimulating properties also help increase blood flow and oxygenate the organ systems. This helps ensure the metabolic activity in body runs smoothly, and allows nutrients to move into cells for repair. Rosemary is an analgesic substance, which means it can be effective in treating minor pains such as headaches or joint pain. The anti-inflammatory properties in rosemary reinforce the natural pain relief element, making it great for joint pain as well. It is a popular herb for treating migraines, and can be topically applied as a paste to the painful area. One of the most common uses for rosemary historically has been to improve memory. This is attributed to it’s ability to increase blood flow to the heart and brain, which improves concentration. The carnosic acid combats damage from free radicals in the brain, and adds neurological protection. This has given rosemary a reputation for being a brain-healthy herb, and it is said to prevent cognitive decline. Oregano is a traditional Italian food spice with over 80 nutrients and an array of health benefits. It is a popular spice in nearly any traditional Italian dish, and is loaded with flavor. Like the other members in Italian seasoning, this herb has practical health use. Oregano inhibits the growth of Klebsiella pneumoniae and Staphylococcus aureus, which are a big factor in respiratory infections. Oregano is also useful in fighting various strains of drug-resistant bacteria. In oil form, oregano can be made into a spray to immediately alleviate upper respiratory infection symptoms. It also encourages sweat production and can help clear out phlegm, making this the ideal herb for treating colds. 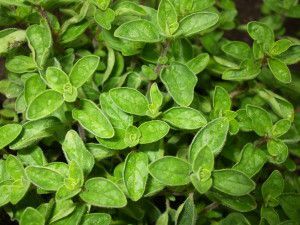 Oregano, like thyme, contains thymol – a powerful antimicrobial. It is effective in fighting bacteria and foodborne illness. It also contains beta-caryophyllin, a substance known for inhibiting inflammation. More impressive, however, is it’s high antioxidant count – 42 times the antioxidants of an apple. This puts oregano as one of the highest natural sources of antioxidants. Italian seasoning is the “icing on the cake” of Italian cuisine. It comes with a pleasing aroma, satisfying taste, and a strong list of health benefits. Adding some Italian seasoning to your dish will “spice it up” in more ways than one. 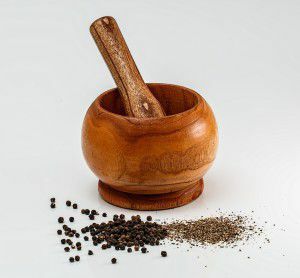 These herbs by themselves are powerful natural medicines, and combined together they are what you might call a “superfood.” Next time you are enjoying some TRADITIONAL ITALIAN CUISINE, take a moment to appreciate the Italian seasoning.